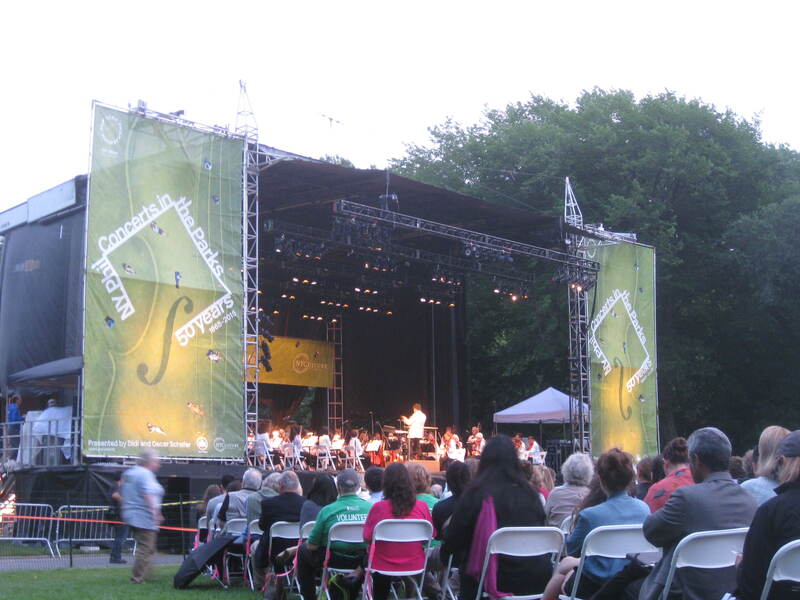 Every summer, the New York Philharmonic performs a series of concerts in parks around the city, taking in all five boroughs. 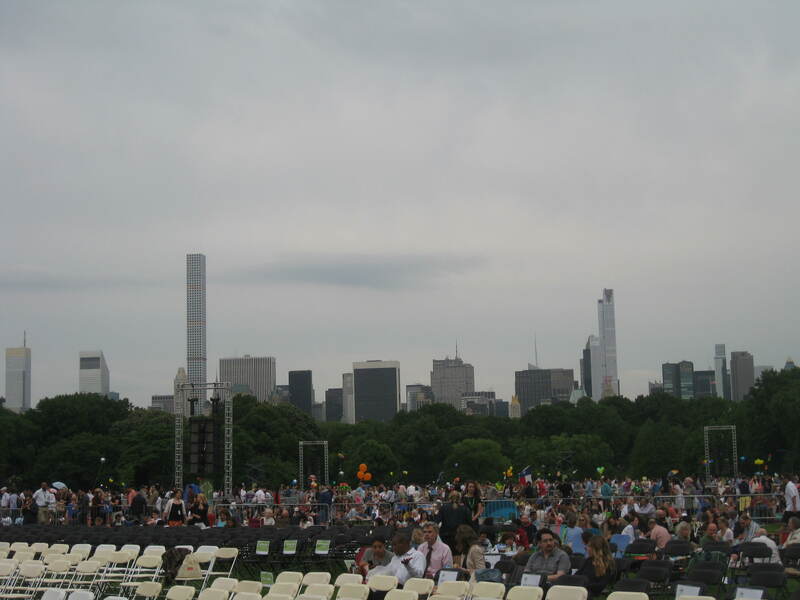 In previous years, my plans to attend have been thwarted by scheduling conflicts and a rain storm, so this year I was even more determined to be among the audience in Central Park. The day in question (last Wednesday, to be precise) dawned warm and sunny, and the forecast was clear for the entire day, so I eagerly packed my picnic blanket and some snacks. By the time I left work and headed park-wards, the sky was grey and the air felt ominous. An unpleasantly chilly breeze had sprung up too, so I dived back into the office to collect my emergency shawl (a vital piece of summer attire, given the ferocity of air conditioning in this city). Arriving on the Great Lawn just over an hour before concert was due to begin, I was amazed by the number of people already in position. Blankets were spread over literally acres of grass, and my hope of getting a good spot vanished, so I wandered a little before plonking myself down on the grass to consider my next move. Almost immediately I heard my name being called, and I turned to see the Philharmonic’s Archivist heading in my direction. I recently finished a 6-month stint volunteering in the Philharmonic archives, and I had wondered if I would see anyone I recognized, but with thousands of people around me the serendipity of that moment was really quite startling. Even more fortunately, she kindly offered me a spare ticket to one of the more exclusive patches of lawn right up near the stage, which I was delighted to accept! Having relocated, I looked balefully upwards as the wind increased and the clouds darkened. Before too much longer it began to rain, and I folded my blanket around myself and thought grumpy thoughts about how this was just typical – of course it would rain on the night I got my special spot near the front. I was also a little cross with myself for failing to bring an umbrella – the normally-reliable New York weather forecasting has clearly made me forget my British training. Thankfully the shower passed over relatively quickly and it wasn’t long before the orchestra took their seats onstage and the concert begun. 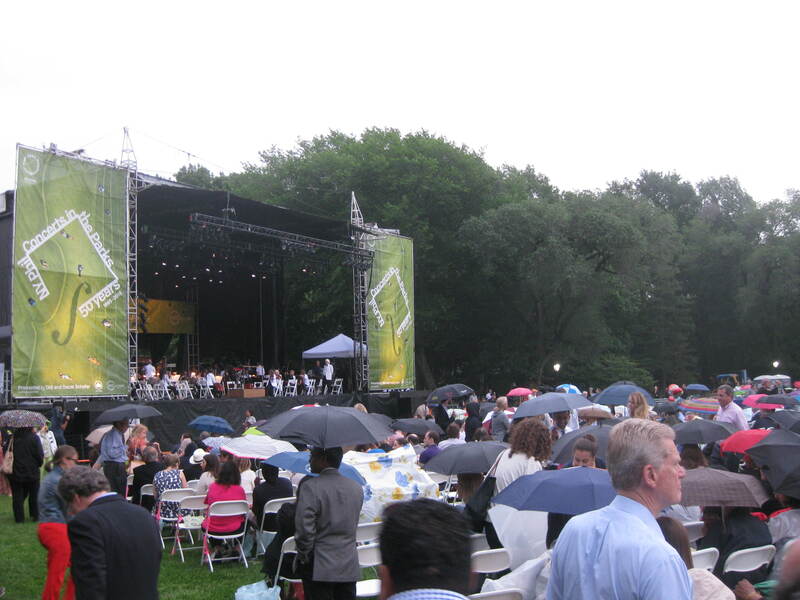 As we enjoyed the opening piece, however, the rain started up again, and as soon as the music finished the front rows of musicians leaped up and scuttled towards the back of the stage. 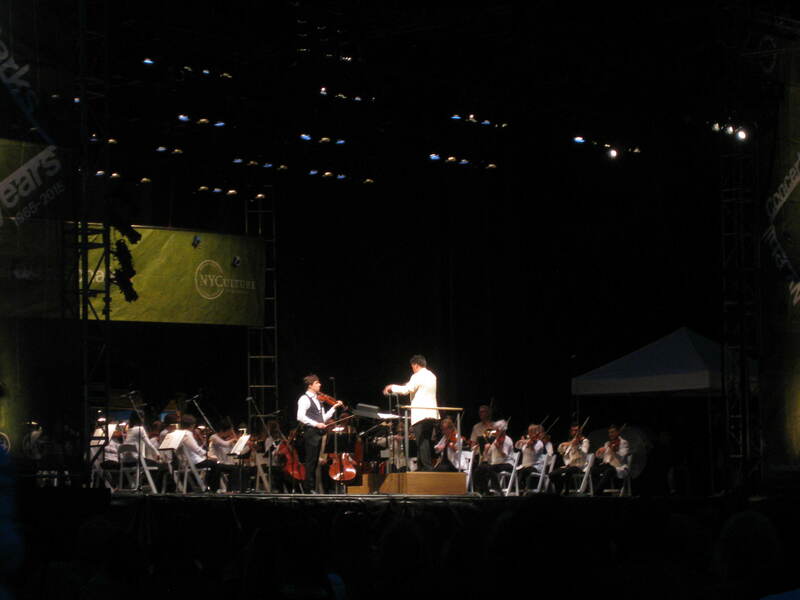 After a fairly lengthy (not to mention soggy) hiatus, conductor Alan Gilbert returned to the stage to announce that they would continue with the concert, but that a few more minutes pause were needed whilst they moved the orchestra further back on the stage. This went down extremely well with the audience, and it wasn’t long before soloist Joshua Bell joined them onstage for a fantastic rendition of Bernstein’s West Side Story suite for violin and orchestra. They followed this with “New York New York” (from On The Town), a truly special moment which made all the discomfort worthwhile! 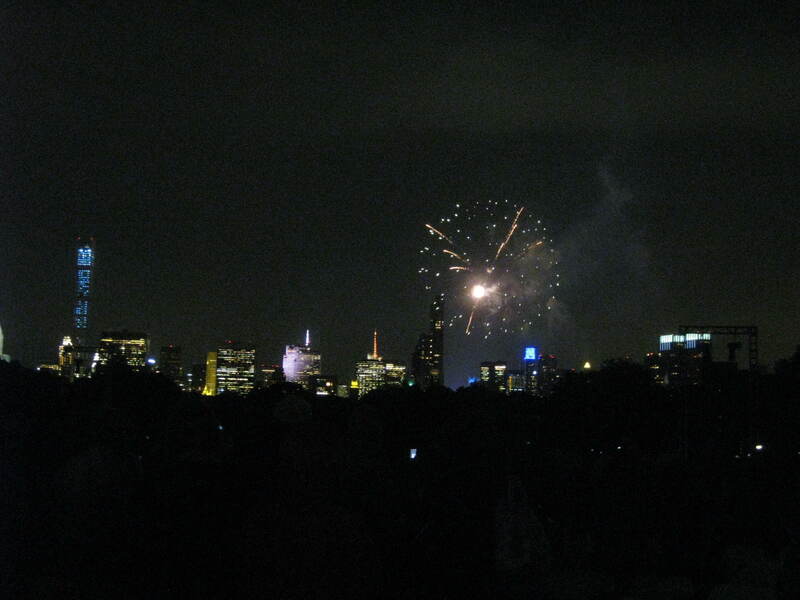 The remainder of the program continued without further incident, and all too soon the rousing strains of John Philip Sousa’s Washington Post heralded the end of the concert. The evening concluded with a firework display which was lots of fun, although I couldn’t help thinking they might have chosen a less distracting background – I’m not sure which set of lights were more eye-catching! 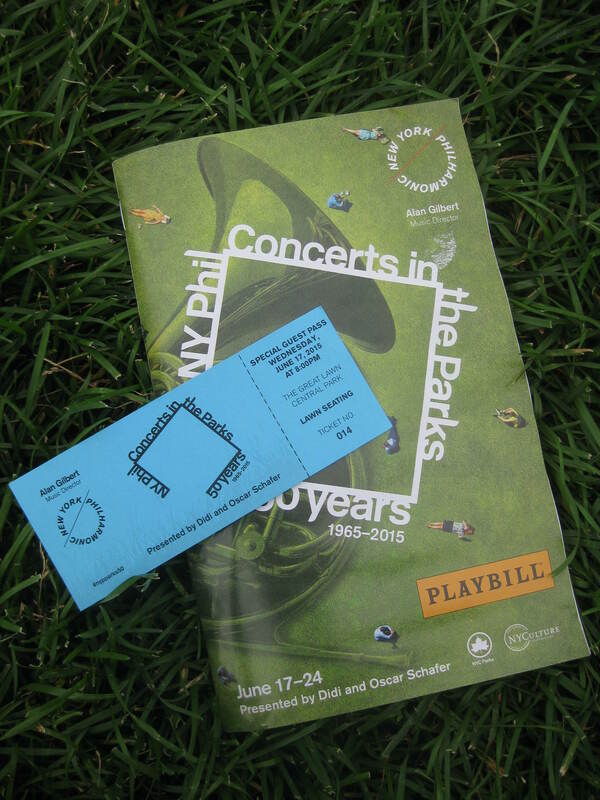 This entry was posted in Music and tagged Central Park, New York Philharmonic, rain by Emma Davidson. Bookmark the permalink.